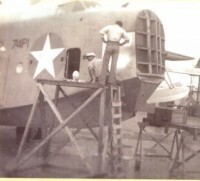 4 Oct 1943: VP-203 received orders to deploy to NAF Aratu, Bahia, Brazil, to relieve VP-74. The squadron was then placed under the operational control of FAW-16. The squadron’s aircraft continued to arrive at Aratu through 23 November; a detachment of five aircraft was formed and sent to NAF Natal, Brazil, for advanced base operations. This group conducted sweeps out to 600 miles from shore. 5 Jan 1944: While on patrol Lieutenant S. V. Brown sighted a suspicious-looking merchant vessel. Subsequent investigation proved that the ship was actually the German blockade runner Burgenland. Omaha (CL 4) and Jouett (DD 396) were dispatched to the scene and sank the ship after a running gun battle. 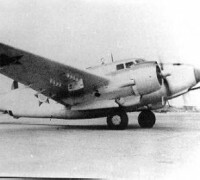 16 Jan 1944: VP-203 relocated its administrative headquarters to NAF Galeao, Rio de Janeiro, Brazil, with one detachment. One squadron detachment remained at NAF Natal and another at NAF Aratu, Brazil. The Aratu detachment rejoined the squadron at Galeao on 23 January. 4 Apr 1944: A U-boat was spotted on the surface at night using the wing-mounted Leigh searchlight. 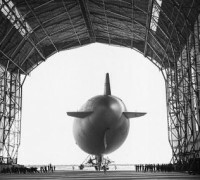 The aircraft made a strafing run, forcing the submarine to crash dive, but with negative results. 21 Apr 1944: Lieutenant (jg) W. N. Britton and his crew spotted 20 British sailors adrift in a small life raft, survivors of a torpedoed merchantman. Ironically, none of the 20 sailors in the raft had been harmed during their ordeal until Britton’s crew dropped supplies of food and water directly on the raft, knocking one man unconscious. The victims were safely picked up a short time later. 16 May 1944: The Natal detachment relocated to Aratu, then on to Florianoplis, Brazil, for advanced base operations. Tender support was provided by Matagorda (AVP 22). These operations were discontinued on 30 July, and they rejoined the Aratu detachment. On 14 August the remainder of the squadron, including the headquarters group, joined the detachment at Aratu. One detachment remained at Galeao until 5 November. 20 Jul 1944: The squadron’s second operational loss occurred when Lieutenant Livio DeBonis and his crew failed to return from a routine patrol. A merchant ship later confirmed that an aircraft crashed, with no survivors, at coordinates matching De Bonis’patrol sector. 4 Oct 1944: Four VPB-203 crews were detached from the squadron and ordered to duty at NAS Corpus Christi, Texas. 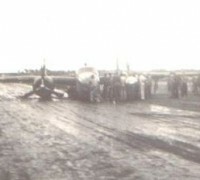 The losses were not filled, decreasing the squadron aircraft complement from 15 to a total of 9. 21 Nov 1944: One of the squadron aircraft was lost en route from Natal to Aratu during an intense tropical thunderstorm. Aircraft wreckage, an oil slick and empty life rafts were found at sea, but no survivors. 5 Jan 1945: A detachment of aircraft was sent to NAF Aratu, Bahia, Brazil, with tender services provided by Rehoboth (AVP 50) and later Matagorda (AVP 22). A second detachment was formed on the 21st at Bahia based on Rockaway (AVP 29) and a third detachment was sent to Natal, Brazil. 29 May 1945: VPB-203 was relieved for return to San Juan, P.R., where all of the squadron aircraft were turned over to HEDRON-11. Squadron personnel were transported aboard U. S. Grant (AP 29) to New Orleans, La., then by train to NAS Norfolk, Va., where the squadron was disestablished on 30 June 1945. Source:Dictionary of American Naval Fighting Squadrons.